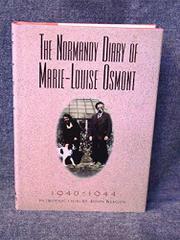  While the 50th anniversary of D-day is being commemorated in many ways, few will be as affecting as the episodic journal of Marie Osmont, an aristocratic Frenchwoman who endured four comparatively pacific years of German occupation and three hellish months of liberation. Her chronicle, the centerpiece of a TV documentary to be broadcast by the Discovery Channel in June, offers a vividly detailed account of what it was like to be a noncombatant caught near Ground Zero when Allied forces made their long-awaited assault on Hitler's Festung Europa. At the time of the invasion, the widowed Osmont was mistress of ChÉteau PÇriers, a sizable Normandy estate about three miles inland from Sword Beach, where British Tommies landed in the early dawn of June 6, 1944. Although Boche soldiers were billeted in and around her home for nearly four years, she kept only sporadic records until the beginning of 1944. In the grim aftermath of Operation Overlord, however, her diary literally comes alive. A thoroughgoing patrician imbued with the spirit of noblesse oblige, the author reveals herself in print as a very human being. Appalled by the manifest horrors of war, she grieves for cyclamens crushed under the treads of advancing armor, fine old trees lost to fortification builders, and livestock slaughtered in the artillery duels that ravaged her demesne, as well as the civilian friends who were killed, wounded, or dispossessed in the fierce fighting. Osmont also proves an acute observer of alien social mores and appreciates the cosmic irony of death and destruction being visited upon rural innocents in the midst of an achingly beautiful summer. Her annals stop abruptly in mid-August of 1944, and the text at hand offers no clue as to her immediate or eventual fate. Eloquent testimony for posterity, reminding us that military campaigns, however just, have awful costs.